A 2-centimeter-wide fake meteor could pose a serious threat to low-orbit spacecraft. To glimpse a meteor shower, sometimes you’ve got to wake up in the middle of the night, bundle up against frigid cold, and wait many minutes or hours. All to see a streak of light, a piece of space that crosses briefly into our world. A Japanese “space entertainment firm” called Astro Live Experiences (ALE) says it will launch its first satellite in 2019 to create artificial meteor showers on demand, for large events or at the whim of the wealthiest among us. Though ALE hasn’t named a specific price per event, BuzzFeed News suggests each ALE meteor shower will likely cost several million dollars. According to CNN, ALE “meteors” will be small metallic pellets made of a proprietary composition that glows orange, blue, or green as they burn up in the atmosphere. Yet unlike ordinary meteors, which are usually around the size of a sand grain, ALE’s fake shooting stars will be substantially bigger — around two centimeters in diameter (smaller than a ping-pong ball, but slightly larger than a marble) — and released in a cloud. “I salute them for cleverness and for their technical expertise, but from an orbital debris standpoint, it’s not a great idea,” University of Michigan astronomer Patrick Seitzer told BuzzFeed. Moving at high speeds brought on by Earth’s gravity, a 2 centimeter-wide object is more than enough to shoot right through a metal spacecraft — and leave devastation in its wake. ALE seems to be taking steps to ensure this would be an unlikely event. ALE’s satellite would likely orbit just below the International Space Station to avoid collisions; any pellet that ALE’s satellite releases will go from an altitude of 220 miles (354 km) to about 37 miles (59.5 km) above the surface before burning up. Rodenbaugh told BuzzFeed that only 40 other satellites orbit below 220 miles, and that the company would call off any event that would put their artificial meteors close to a tracked satellite. Yet fake meteor showers could still impact spy satellites, which are not tracked and can dip as low as 158 miles. Low-earth orbit (that is, anything under 2,000 km (1,200 miles) from the Earth’s surface) is also slated to become a lot busier in the coming years, Seitzer told Buzzfeed. Indeed, there are plans in the works that suggest low-earth orbit is about to become a lot more crowded. SpaceX and other companies plan to send up a number of satellites to establish satellite-based internet services; SpaceX alone plans to put over 4,000 of them between 700 and 900 miles (1,100 and 1,400 kilometers). There are also the high-speed rockets and space planes that companies plan to fill with tourists, and low-altitude spacecraft that the military wants to use to deliver yet more satellites. Add thousands of falling metal pellets to the 500,000 pieces of man-made debris we already know circle our planet, and the risk for any of these spacecraft becomes significantly higher. 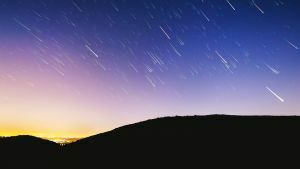 Call us purists, but artificially creating shooting stars also overlooks what makes meteor showers so incredible in the first place: that you never know exactly when you’re going to see them. Paying for a manufactured one doesn’t exactly have the same thrill. (May we humbly suggest you instead use your considerable wealth to address the problem of light pollution, so that more people could see natural shooting stars?) Creating a space hazard simply to provide a cheap imitation of a natural wonder seems to be missing the point.